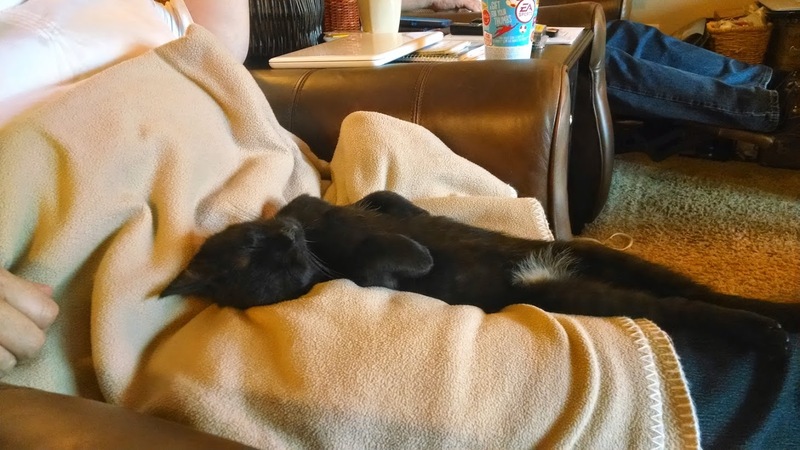 Pippin sleeping in my mom’s lap. Yesterday my family and I celebrated my brother-in-law’s and my dad’s birthdays. Although it was a bummer the weather couldn’t be lovely, we didn’t let that ruin our fun. We had some delicious fajitas, fruit, and brownies and for lunch and visited for a portion of the afternoon. I even brought Pippin! So glad my parents aren’t against him because I thought it would be a good test to see how he did at other people’s houses as well as in the car. I want to bring him to the mountains for the week-long vacation I’m taking in August, so as often as I can, I want him to be in new situations. So far he’s been doing superbly. He goes outside on a regular basis and generally seems comfortable, he’s been to the vet twice and hasn’t had major issues, and he’s been in the car multiple times. He sat in Gene’s lap for the majority of the ride and didn’t cry once. I think he was just thrilled that I didn’t put him in the box like I have all the previous times. 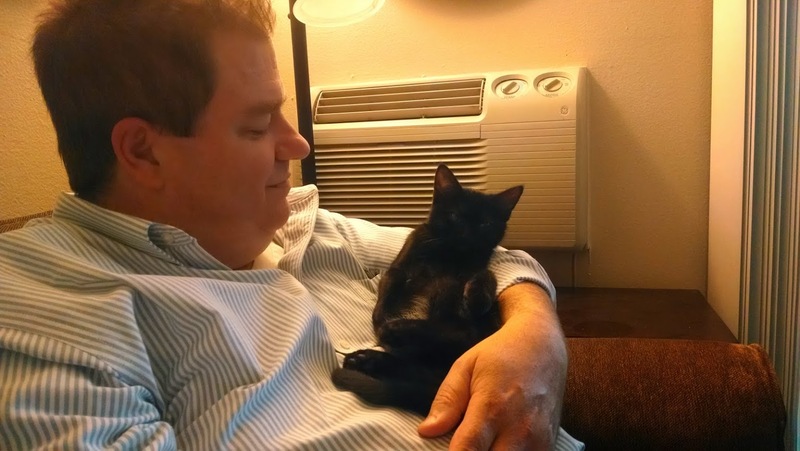 Pippin resting in my dad’s arms. I think Pippin had a fun time at my parents’ place because for the rest of the night, he was asleep almost the whole time. He just got so tuckered out from all the new sites and smells that it sucked out all his energy. I’m going to try to bring him to my parents’ house a few more times before the trip and hopefully take him to Kaitlin’s house too, which is a longer drive. We’ll just have to see how it all goes. I’m glad I was able to spend the weekend with my family in celebration of birthdays. Next Post Day 330. Summer peaches! So fun! I think everyone had a great time – especially Pippin! He is so adorable and such a character.